The upcoming Indian elections will be the largest democratic elections in the history, with over 600 million Indians expected to cast their votes to choose their next ruling political party and the Prime Minister. With Internet population increasing drastically over past few years, it has become one of the major sources for information, communication and feedback for citizens and politicians alike. And, who else but Google is at the center stage for dispersing information to Indians. Google’s India election hub has now got a major facelift and is offering features that will help millions of online Indians get information they want in regards to various Political parties and their candidates. This revamped elections hub is now the home for “Pledge to Vote” campaign, where citizens can pledge to vote and also say as to why they should vote. Using their map-tool, citizen can not only share why they pledge to vote, but also view why other fellow citizens across the nation are pledging to vote. The hub also features a “Google score” tool which reflects the amount of search activity for a person in the previous 24 hours using Google Search and YouTube, combined with the amount of engagement with a person’s name on Google+. 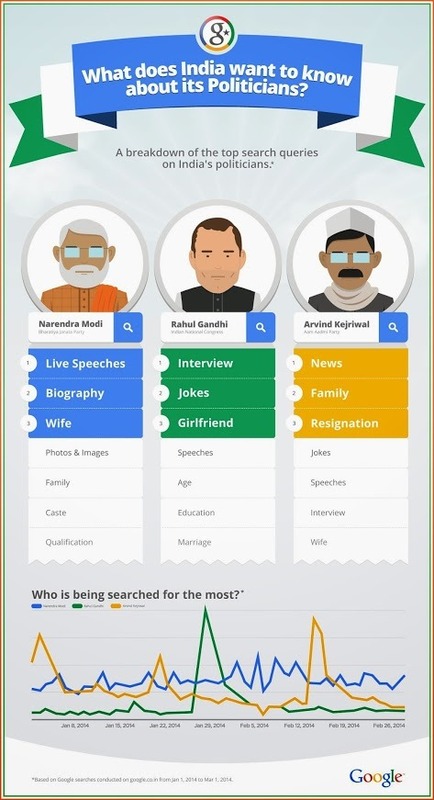 Everyday the election hub will display five politicians with the highest Google Scores from the previous day. Here is what it shows right now. Narendra Modi remains the most popular politician online by a fair margin with Arvind Kejriwal coming in at second position. Interestingly, Manmohan Singh is marginally more popular than Rahul Gandhi, latter most probably being Congress’ PM candidate. The election hub also features new search trend infographics, YouTube Election playlists (at YouTube Elections hub), and where users can tune into current and upcoming Hangouts with politicians. 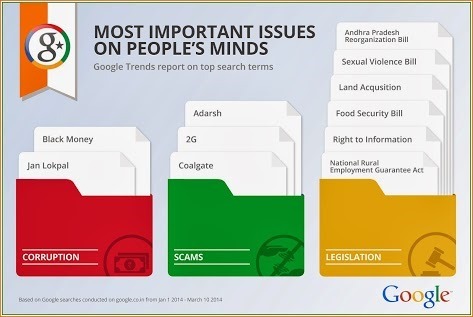 Here is another infographic that shows a breakdown of related top search queries for various politicians. I had a chuckle when I saw what people are searching when it comes to Rahul Gandhi! Yeah.. the famous Arnab-Rahul interview still remains on minds of Indian citizens! Visit Google Election Hub to find more.